DynoTune Product, 109.3-Motorcycle Tube Frame Mounted Bottle Bracket - DynoTune, Nitrous systems, Purge kits, Nitrous Bottle heaters and more! 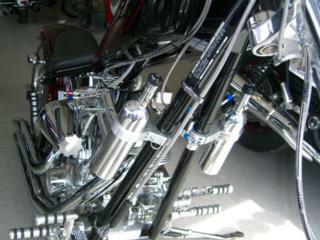 Motorcycle Tube Frame mounted Billet Bottle Bracket for small motorcycle bottles. Killer quality, check out the pictures....Simple installation. Select the size frame tube you have when adding to your shopping cart. . Firmly secure design will not let the bottle rotate or vibrate loose, the ultimate Bike bottle bracket! Only one needed per bottle. WORKS WITH 12oz (2.5" diameter) bottles only! Other sizes coming soon.